JENNINGS COUNTY—It seemed fitting that an emotional Cardinal-designate Joseph W. Tobin celebrated his last Mass as archbishop of Indianapolis at St. Ann Parish in Jennings County, which lies close to the geographic heart of the Church in central and southern Indiana. The Mass took place on Nov. 6, less than a day before it was announced at the Vatican and in Washington that Pope Francis had named him the new archbishop of Newark, N.J. Although unable to confirm his appointment during the Mass because it had not yet been officially announced, Cardinal-designate Tobin acknowledged during the final moments of the liturgy that many of the worshippers may have heard media reports about him over the weekend. “But I have to tell you this—if I was to celebrate my last Mass as the archbishop of Indianapolis, I’d be really blessed to celebrate it with you,” he said, his voice marked by emotion. He remained close to tears when giving the final blessing of the Mass to the approximately 200 worshippers who had gathered that day to celebrate the 175th anniversary of the founding of the Seymour Deanery faith community. St. Ann Parish reaches back to the earliest days of the Church in Indiana, being founded in 1841, just seven years after the establishment of the Diocese of Vincennes, which later became the Archdiocese of Indianapolis. Nestled in the rolling hills of southern Indiana and surrounded by farms, many of which are cultivated today by the descendants of the original German Catholics who first settled the land, the parish is also emblematic of the distinct character of the Archdiocese of Indianapolis. Cardinal-designate Tobin had originally been scheduled to celebrate the anniversary Mass during the summer, but a scheduling conflict brought about its move to Nov. 6. Cardinal-designate Tobin left St. Ann Parish that afternoon, and that evening boarded a flight in Indianapolis for Newark. 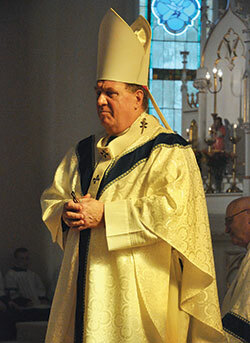 When the official announcement about his appointment to lead the Archdiocese of Newark was made the following day, he ceased to be archbishop of Indianapolis. But he still retains a soft spot in the heart of many St. Ann parishioners, whose faith community is at the heart of the archdiocese and who now cherish the privilege of having worshipped with him in his last Mass as archbishop of the Church in central and southern Indiana. “It’s kind of exciting, something we’ll always treasure,” said St. Ann parishioner David Gasper, 24, whose ancestors helped found the parish. “It’s exciting to know that, if Pope Francis has called him to something bigger and better, his final step was here. Gasper’s wife Jessica was happy to have worshipped with Cardinal-designate Tobin in his final Mass as archbishop, but also expressed mixed feelings about the news. Russell Sherman likewise was sad to learn that the archdiocese’s shepherd was being called elsewhere, but will keep good memories of him. Father Jerry Byrd, pastor of St. Ann Parish as well as St. Joseph Parish in Jennings County and St. Mary Parish in North Vernon, was filled with emotion after the liturgy, knowing that he was losing his spiritual father.